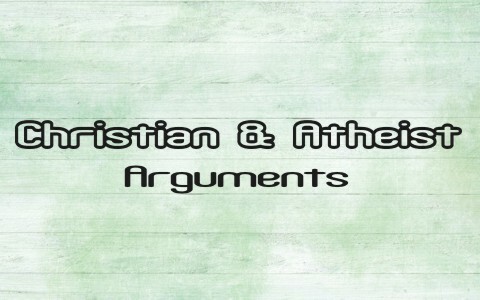 Should Christians be engaged in debates or arguments with Atheists? If you are familiar with Jesus’ earthly ministry you should notice that He never pushed Himself or believing in Him on anyone. The fact is that He did respond to the Jewish leaders when they attacked God’s truth, His Law, or His disciples, but other than that, He never tried to argue or debate anyone into the kingdom. Rather, He only reiterated what the Jews should have known and that was that He was the long-prophesied Messiah. When they associated Jesus’ miracles with the work of Satan, then He warned them about crossing a line in which they could never cross back over and that was blaspheming the Holy Spirit, which for them, is unforgivable. They had seen His miracles, they knew He was the Son of David, they understood that He was of the Tribe of Judah and yet they hardened their hearts to the truth that if in Jesus Christ, therefore they were without excuse. Just as ancient Israel had been jealous of Moses’ and Aaron’s position (Psalm 106:16-17), Jesus “knew that it was out of envy that they had delivered him up” (Matt 27:18). Jesus warned His followers to be careful to whom they give the truth to because the enemies of the cross don’t want to really debate to have Christians prove that Jesus existed or that God is real. They only sought an argument for the sake of an argument, therefore Jesus said “Do not give dogs what is holy, and do not throw your pearls before pigs, lest they trample them underfoot and turn to attack you” (Matt 7:6). If someone asked you to prove the existence of God, don’t go there. They only want to debate in order to prove themselves right, even though it’s humanly impossible to prove that God does not exist, so Solomon would suggest “Answer not a fool according to his folly, lest you be like him yourself” (Prov 26:4). If we begin to argue with non-believers, they will turn on you, no matter how strong your reasoning’s are. Don’t descend to their level and “Do not speak in the hearing of a fool, for he will despise the good sense of your words” (Prov 23:9) so “Leave the presence of a fool, for there you do not meet words of knowledge” (Prov 14:7), even if you have godly wisdom. If we understood that atheists don’t really want to be shown that God exists and that they are intentionally suppressing the knowledge of God and by “their unrighteousness suppress the truth” (Rom 1:18b) since “what can be known about God is plain to them, because God has shown it to them. For his invisible attributes, namely, his eternal power and divine nature, have been clearly perceived, ever since the creation of the world, in the things that have been made. So they are without excuse” (Rom 1:19-20). Even though “they knew God, they did not honor him as God or give thanks to him, but they became futile in their thinking, and their foolish hearts were darkened” (Rom 1:21), and so it is pointless to argue with someone who really, in their heart, knows that God exists. The New Testament is full of advice to not argue with non-believers and so writes, “If anyone is inclined to be contentious, we have no such practice, nor do the churches of God” (1 Cor 11:16). Although this was about certain traditions of the church at Corinth, Christians must “avoid irreverent babble, for it will lead people into more and more ungodliness, and their talk will spread like gangrene. Among them are Hymenaeus and Philetus, who have swerved from the truth, saying that the resurrection has already happened. They are upsetting the faith of some” (2 Tim 2:16-18) and so “the Lord’s servant must not be quarrelsome but kind to everyone” (2 Tim 2:24). All we can do is pray that “God may perhaps grant them repentance leading to a knowledge of the truth, and they may come to their senses and escape from the snare of the devil, after being captured by him to do his will” (2 Tim 2:25-26). We must simply “Remind them of these things, and charge them before God not to quarrel about words, which does no good, but only ruins the hearers” (2 Tim 2:14) so “avoid foolish controversies, genealogies, dissensions, and quarrels about the law, for they are unprofitable and worthless” (Titus 3:9). The Apostle Paul did a lot of engaging with non-believers, like the Greeks, and asked, “Where is the one who is wise? Where is the scribe? Where is the debater of this age? Has not God made foolish the wisdom of the world” (1 Cor 1:20)? Even though this was not about the existence of God, the principle is the same, and that is we must “Avoid the irreverent babble and contradictions of what is falsely called “knowledge,” for by professing it some have swerved from the faith” (1 Tim 6:20-21). Don’t argue with non-believers because no one was ever argued or debated into heaven. That’s not how God saves people. We can win a debate but lose an opportunity to witness. I would rather lose a debate and win a soul than win a debate and lose a soul. More reading for you on a related subject: Do Atheists Really Believe There Is No God? I agree 100% with you Pastor Jack regarding those who are not going to be convinced against their wills. Those who are waiting to catch you in your words and make a mockery of the Words of Life. Having said that I think you agree with me that there are many who claim to not believe in God whom we can share the Gospel. I am not talking about heated debates or trying to win an argument. I speak regularly with the aged patient who does not believe in God but does share some passion in life. I am thinking about a lady who claims to not believe in God but loves action/detective books. I remember our conversation when I asked her, “Have you ever wondered why the best stories in literature usually involve an antagonist(the villain), a protagonist(the hero) and a triumph of good over evil(the resolution)?”. I went on to explain that I was drawn to Christianity because of the beauty of that story. There is evil in the world and an evil villain(the devil). There is a victor(Jesus defeating the villain) and a resolution of Jesus granting eternal life to all who believe in His victory. I believe, I told her, that God implants in our hearts a longing for these stories because of this beautiful way He has of imprinting His story on our hearts. She looked strangely at me and said, “I have never thought about it that way”. I said , “think about it” and went on with the exam. I had an 86 year old woman last week as a patient and she told me she reads her Bible every day. I asked her if she knew Jesus as Savior. She said she didn’t believe in Jesus. I asked her what was going to happen to her when she died. She said she was going into the dirt and that was that. I asked her to consider Christ and the fact that He paid the price for our sin to save us from hell. Believing in Him will give us eternal life. I asked her to wager on the side of belief for she has nothing to lose and everything to gain as statistically she was soon to stand before God. I went on with my exam. I don’t know if those seeds will ever produce fruit but I think you agree that we have to try with those who claim to be atheists. Not arguments which I know was the gist of your article but earnest persuasion to help save these poor lost souls from the fate that awaits them without Christ. You are so kind…but as we both know, all glory to God. I know that there are growing numbers of atheists today and we must be ready to give an answer about that hope that’s within us. May God richly bless you Mrs. Clyburn. Thank you. Next post: What Is The 7th (Seventh) Commandment In The Bible?